Everybody wants something. People want a large house with columns, a new partner, a different body and a vacation in Tahiti. They even want a new life – at least a new work life. At least that’s what the statistics and my observations reflect. If so many people are longing to be in their dream career, then why have so few actually achieved that goal? The answer, my dear reader, lies in the difference between wants and commitments. Want: n. the state of desiring something that is absent or unavailable. Wants are our hopes, dreams, ambitions and passions. Wants keep us going, but they’re a dime-a-dozen. This is because they’re so easy to have. Wanting does not require an action. You can lie on your couch watching “Lifestyles of the Rich and Famous”, and all the while your wants float in and out of your head as easily as fantasies, which is about what they are. 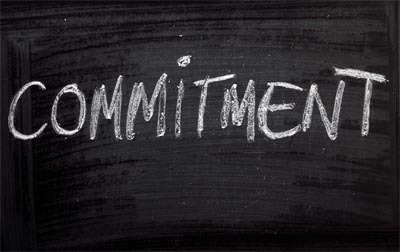 Commitment: n. the act of binding yourself (intellectually or emotionally) to a course of action. Commitments, on the other hand, are requirements that you establish for your life. They are solemn promises to achieve a specific outcome. They supply you with the raw energy-the motivation-you need to live an extraordinary life. Anyone who’s ever made a serious commitment can attest to the power such commitments can have. Simply uttering the powerful “I will” forces you to take the road-less-traveled. Fortunately, in life, the road-less-traveled is usually the one that leads to the pot of gold. Most people avoid commitments. I believe it is because they know of the power that a commitment holds over them. They have a natural sense (possibly reinforced by experience) that a commitment equates to “a difficult path with no turning back”. And not many people want to be put in that position. But the history of human achievement has proven time and time again that making a commitment can lead to greatness. Who do you think has a likelier chance of saving money? The bottom line to all of this is that if you want to achieve a fulfilling career, you must make some commitments to yourself. There’s no way around it. The problem with most career choice programs is that they build an incomplete list of wants and often no list of commitments. I have found that the most effective way to accomplish the first step is through a combination of (a) introspection, (b) personal assessments and (c) exercises/inquiries. The result is a list of your career dreams that fits your aptitudes, personality, values, interests, goals and preferred work environment. Once you have that list, you can start on the second step-deciding what you want to commit to, what you’re willing to work for, and how you can achieve a fulfilling career. As a start, I recommend that you take a sheet of paper and write down every one of your career-related desires. No matter how crazy it sounds to you, if you’d like it in your career, put it down. Once you’ve identified your wants, you can start to focus on commitment. Why don’t we get what we want? Because life simply is not fair. In fact, it can be downright crappy at times. Our odds of stumbling into a wholly wonderful life are only slightly better than hell freezing over. But the odds increase dramatically when you commit to having a wonderful life.